Automation for every Home, Business and Style. Allonis works to provide you with the best most versatile automation solutions available. Select your automation elements and choose a device. myServer is built on the premise that you want to integrate many disparate products. We built our automation framework around the idea that a control system needs to make it easy for the system integrator to add support for different device protocols of popular systems. That you want an easy way to modify the user interface without caring about how the devices talk to each other. And to use the system not caring about how the system performs the task. We keep up with the best products in the industry to wrap all those good pieces into the best overall system. Our framework is suitable for new users as well as seasoned professionals. There are enough tools in the server administrator and in the scene designer to help you implement your own masterpiece without having to get your hands dirty by digging into the code. If you have a specific need, we are here to help! Many of the products in the suite originated from a customer or dealer asking us to do something special. That ended up being what most all other customers want. Let us know how we can help you. We built our system around the idea that a modern automation system should take advantage of the huge investment Intel, Microsoft, Google and others have made to ensure a high performance but relatively inexpensive system. Whether this is the first automation system or the expert. Our framework is suitable for new users as well as seasoned professionals to easily add new devices from a myriad of what's available. 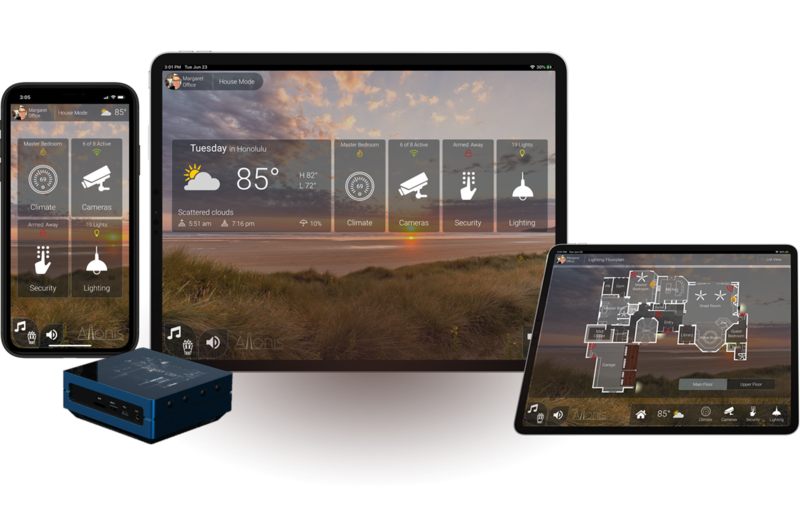 Allonis interfaces are completely customizable. Take control of how you use your automation systems by putting buttons where you want them. Change colors and background images with ease. If you don't feel you have the touch let our creative team do it for you! Select a source on the left and then select the TVs you want to change on the right. You can build a home or business control system one step at a time by introducing smart lighting, climate, security, home theater control and more as your client's needs grow. Allonis' solutions interoperate with thousands of third-party consumer electronics devices, making the system easy to install and integrate with your customers' existing equipment. We strive to help you build the best possible business for your clients with 24x7 online ordering, white glove support and dealer-friendly business policies. When you’re successful so are we.